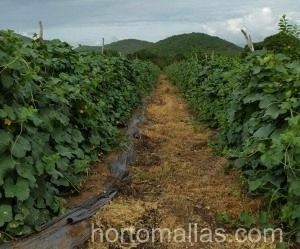 HORTOMALLAS melon netting will allow fruits to stay away from the ground and not be affected by soil humidity and stains. 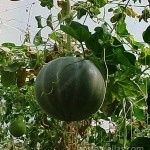 The great advantage of growing heavy cucurbits in the air is that they will be less prone to humidity born diseases and the fruits will not discolor on the side they touch the ground. 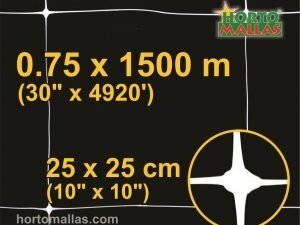 Also you will be able to increase plant density as the foliage will be developed vertically rather than on the ground. 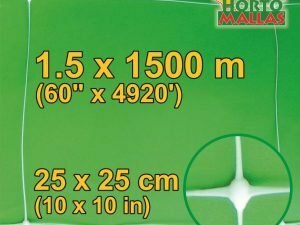 One must keep into consideration that fact that excessive handling of plants increases the possibility of diseases spreading mechanically, as one worker may propagate the pathogens unknowingly from plant to plant by handling a diseased one. Melon trellises allow the cucurbits´tendrils to attach by themselves to the support system and reduce the need for manually handling the plants. HORTOMALLAS melon trellises allow the cucurbits´tendrils to attach by themselves to the support system and reduce the need for manually handling the plants. 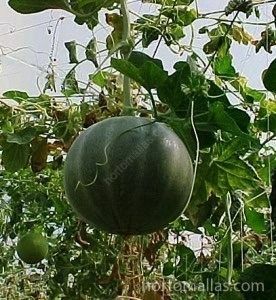 Also as the plants develops vertically its branches will stay away from people stepping and stomping on them, breaking vegetative tissue, as these cuts and bruises then becomes a pathway for pathogens to enter the lymph system and affect the whole plant, besides the mechanical stress caused. 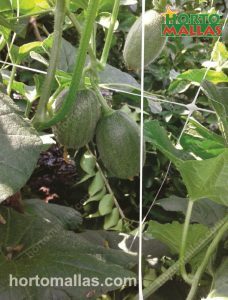 These melon plants where placed at the traditional distance between rows, but were trained vertically using HORTOMALLAS trellis netting. One may notice that the plants could have been brought closer together. Growing melons vertically using HORTOMALLAS has proven to yield between 80 and 110 tons per hectare, clearly the cost of HORTOMALLAS is easily absorbed by the increased production, confirming that the investment in trellis netting is paid in the first crop cycle, and when one considers that HORTOMALLAS can be reused for at least 3 times (given the proper phytosanitary protocols) the horticulturist will realize that trellis netting is just as important as mulching the furrows or using modern drip irrigation! 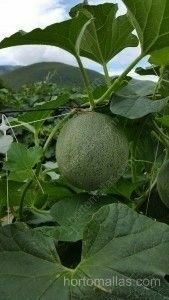 Melon trellis net improves the quality of pruning and reduces the labor force thanks to the reduced need to walk among the fields to turn fruits over in their baskets to prevent them from becoming a stained yellow color on the side that would have been in touch with the soil. HORTOMALLAS melon trellis has helped melon growers world wide increase their yields, won´t you give it a try? 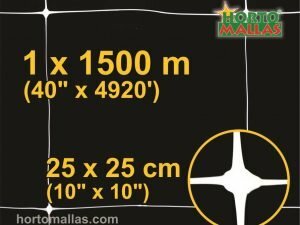 HORTOMALLAS Melon net for trellising melon plants, will increase the number of plants on the row.